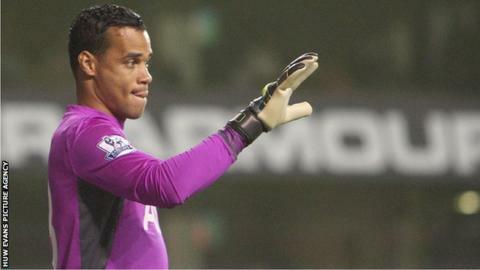 Manager Garry Monk is confident Swansea will avoid sanctions over the transfer of goalkeeper Michel Vorm to Tottenham. The Dutchman's former club Utrecht are taking the Swans to the Court of Arbitration for Sport over money they claim to be owed by Swansea. They say the clubs agreed a sell-on clause when Vorm joined the Swans for £1.5m in 2011. The goalkeeper left the Liberty Stadium for Spurs in 2014, a deal which the Swans say was a free transfer. At the same time, Wales defender Ben Davies joined Tottenham in a swap deal involving Icelandic midfielder Gylfi Sigurdsson - a move Swansea claim was separate. Utrecht have already failed with an appeal to Fifa and Swansea have confirmed they are aware of the latest move, but Monk is unconcerned as he believes "from our side everything is fine". He added: "That is left with the club, that's not really a focus for me. It's up to the chairman to deal with. "From our side everything is fine. I'm sure the club has followed everything to the letter and all those issues will be left with the club. "We're a perfectly-run club. The decision earlier in the season from Fifa was all OK, so I think that proves everything. "If they want to pursue it, that will be left to the chairman and the board to deal with that." A Swansea spokesman added: "Fifa have looked into this and ruled in our favour, but Utrecht have always got the right to appeal. "The club is aware that that is what they are doing."